Super easy gluten-free Apple Pie Blondies are a soft, blonde brownie topped with delicious cinnamon apples and maple vanilla glaze. It’s still super hot here in North Florida, but that’s not keeping me from baking my favorite fall goodies. As soon as September hits, I am all about apples. I love how versatile apples are in cooking. They can be used in both sweet and savory dishes. My husband is a cake versus pie guy, so I decided to combine the best of both worlds. You get the apple filling goodness of pie and the sweet cakey flavor of a blondie. First, preheat oven to 350º F degrees. Then Spray the 8×8 square baking pan with gluten-free non-stick cooking spray or line the baking pan with parchment paper and coat the bottom and sides with gluten-free nonstick cooking spray or butter. I always line the baking pan with parchment paper and coat the bottom and sides with gluten-free nonstick cooking spray or butter. It makes getting the blondies out of the pan a breeze. I just lift the blondies out of the pan carefully with the parchment paper, place on a cutting board and then cut them into slices. In a small pan add butter, apples, brown sugar, cinnamon, and vanilla. Cook over medium heat until butter and sugar is melted. Stir the diced apples to fully coat the apples in the butter sauce. Bake for 35-45 minutes. Please watch your blondies because all ovens are different. The sides on the blondies will start to pull away from the sides and they will be golden brown. You can also check by inserting a toothpick into the center comes out clean. Allow the blondies to cool for one hour before adding the glaze. If the blondies are too hot the glaze will just melt. 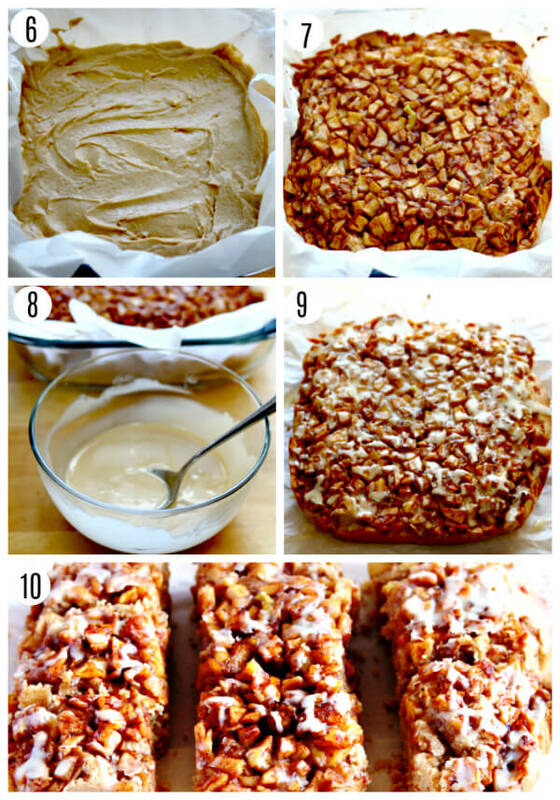 Remove the blondies from the pan by carefully lifting them up with the parchment paper. Cut by rows. It will make 9 large slices. (photo 10) Enjoy! Store in an air-tight container and refrigerate. I actually like them best cold. I have also included a dairy-free option to my gluten-free Apple Blondies recipe. 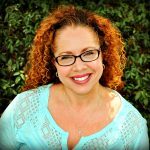 My husband, my youngest son, and I are all dairy-free. I promise it is just as delicious made with the dairy-free butter. 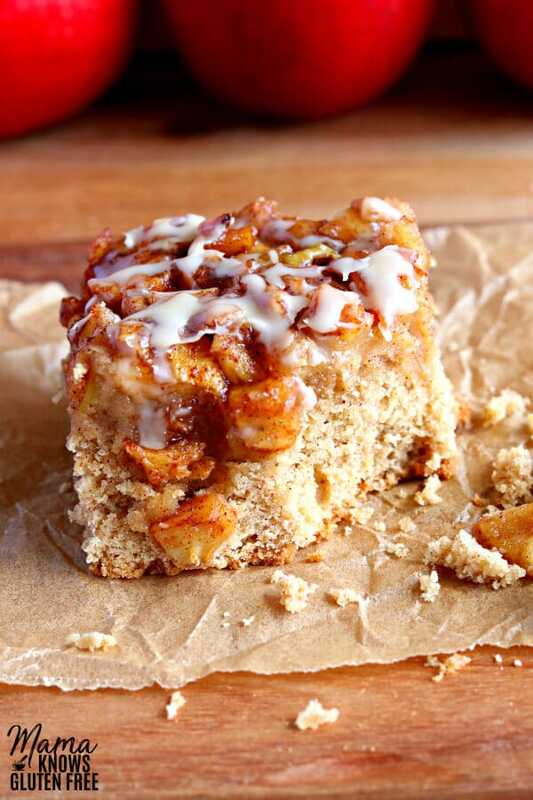 Apple Pie Blondies are super easy to make. 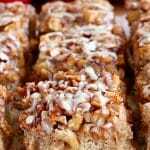 I like to bake with either Red Delicious, Honey Crisps, Gala or Granny Smith Apples, but any type of apple will work beautifully in this recipe. 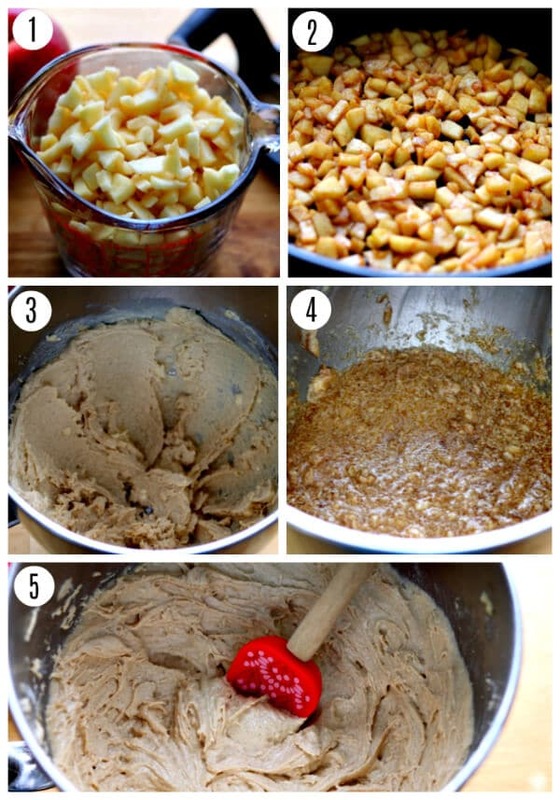 The apple pie filling and blondies batter are quickly whipped together. 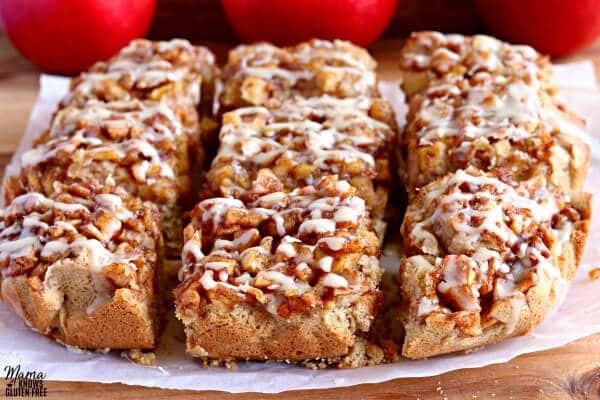 The vanilla maple glaze complements the flavors of the Apple Pie Blondie perfectly. All the flavor of apple pie combined with a soft blondie cake. Looking for other gluten-free apple recipes? Check these out! 1 1/2 cups gluten-free all-purpose flour flour I like Pillsbury gluten-free flour. Not all gluten-free flours are created equal. You may experience different baking results depending on the gluten-free flour blend you choose. Spray the 8x8 square baking pan with gluten-free non-stick cooking spray or line the baking pan with parchment paper and coat the bottom and sides with gluten-free nonstick cooking spray or butter. Peel, core and dice apples into small pieces. I like to use my apple slicer. In a large bowl cream the butter and brown sugar. Add eggs and pure vanilla extract and beat with your mixer until ingredients are fully combined. Add the cinnamon, baking powder, xanthan gum (leave out if your flour blend already has it) and gluten-free flour and mix until ingredients are fully combined. The blondie batter will be sticky. Pour the blondie batter into the parchment lined pan. Pour the apple filling on top of the blondie batter and spread to cover evenly. Bake for 35-45 minutes. Please watch your blondies because all ovens are different. The sides on the blondies will start to pull away from the sides and they will be golden brown. You can also check by inserting a toothpick into the center comes out clean. In a small bowl combine the ingredients for the vanilla maple glaze. Whisk until the glaze forms and is smooth. 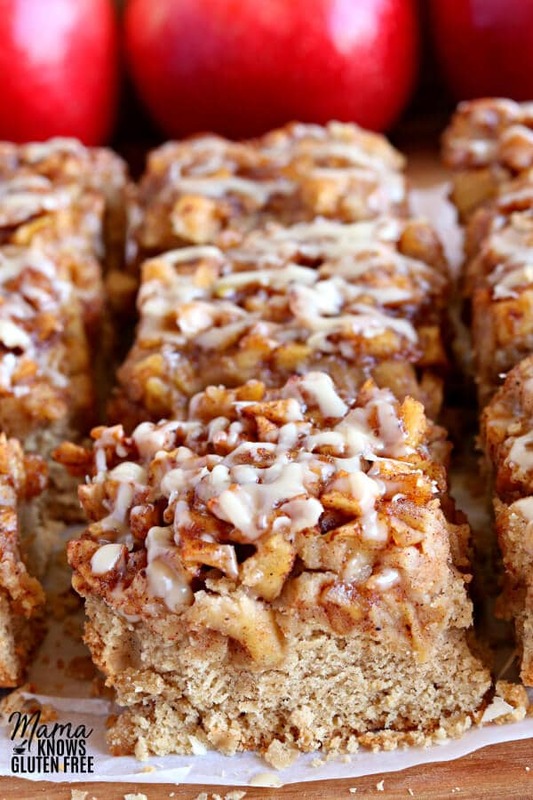 Drizzle glaze on top of warm apple pie blondies. Remove the blondies from the pan by carefully lifting them up with the parchment paper. Cut by rows. It will make 9 large slices. Enjoy! 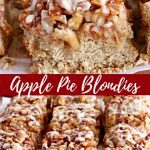 I like to bake with either Red Delicious, Honey Crisps, Gala or Granny Smith Apples, but any type of apple will work beautifully in this recipe. I like to use my apple slicer. Dairy-free version made with Smart Balance butter.